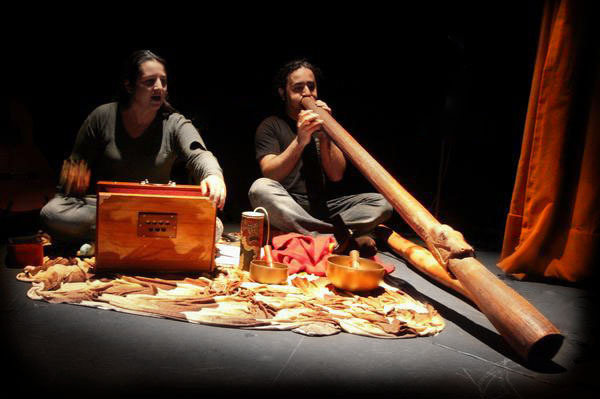 After a trip to India, Adela Torralba and Luis Lumbreras they compose the group, which they present to the public in the TIS theatre, in Madrid, inside the programming of La Alternativa Festival with the project "Sounds for Ganesh", where they show his particular way of understanding music, improvising with instruments as powerful as didgeridoo, from aboriginal people of Australia, or subtle, as hang, tibetan bowls, vietnamese harps of mouth, tanpura, from India... Across these sounds, wrapped in Adela's enigmatic voice, interpreted as one more instrument, they generate sonorous atmospheres that evoke a trip to our interior, where we meet again with places of our soul or emotions that make us remember and feel our real essence, magic, dreams, peace, our ancient memory... and ocasionally the electronics sounds, since they return to be summoned for the following edition of La Alternativa one year later, where they play with Dj Desolé (Paolo Pérez), with whom they compose "Trip to the center of the moon". This epoch is marked by some very interesting performances in some places of Madrid, as well as the participation in the B.S.O. of the film "Singing under the earth", of Pentagrama Films, directed by Rolando Pardo and presented in the Princesa cinemas in Madrid. Also it is necessary to mention his step along some festivals of the national territory and that Adela and Luis produce the B.S.O. 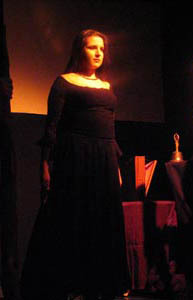 of the play "Woman at Point Zero" of Nawal El Saadawi, directed by Ilda Fava and that they represent in multitude of stages. Again and for third consecutive time the La Aternativa Festival proposes Chandra's performance, which in mutual agreement decides to give a draft to his musical style and to do without the electronics to return to the organic, pure, "more real" sound if it can be said and in this return to the origins they present "Gondwana" that they elaborate whith Roberto Kenyon, artist with whom they have shared different groups previous to the current one; Juan Barajas, MeRe and Sara Moreno, with Indian table, berimbao, cajón, flutes... where his personal and eclectic style consolidates and remains clear. They are chosen by the magazine In Stock as soundtrack of its second number. 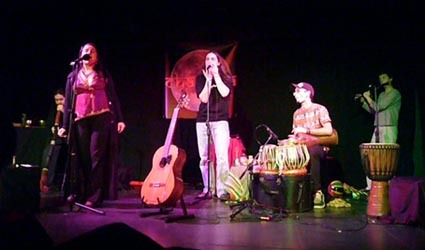 Adela and Luis have been performing in TIS theatre during more than one year with "The magic book of sounds", workshop - spectacle, where they discover and tell histories on the didgeridoo, jew's harps, the shuruti peti and others, habitually little common, improvising and interacting with the public. This work is directed especially the infantile public, but also childish hearts between 2 and 80 years. They take part in the soundtrack of the Book - CD Mundo Lavapiés and realize also music for some videoart works of Ouka Leele, like Ritual or Inédita, movie of the playwright and writer Rafael Gordon, who speaks about the work of this recognized photographer and who had the first national photo award. They make music of the short film "Horror vacui (56)" of Jorge Mangas. 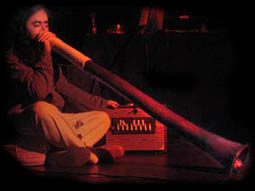 The National Ballet shows in September 2008 "The Heart of Green Stone", which it possesses almost two hours of an absolutely impressive music composed by Jose Nieto and in the one that includes the didgeridoo, being Luis Lumbreras one of his interpreters. Chandra, whose meaning is moon in hindi, invites us to enter and discover his particular sonorous universe; a fresh, risky offer, where the improvisation makes flow the tribal spirit and the magic of pure sounds and sacred instruments. Of Chandra's hand we will be able to recognize our more universal part, where emotions transform in music.